The’re is nothing more comforting that to be included after having been excluded from something, isn’t it? Like when your stomach stops digesting something you have loved all your life and you can’t have it anymore? And then you can have it again! My favorite – and very Italian – breakfast has always been a slice of cake with a caffe-latte. Then I discovered to be intolerant to wheat (not celiac) and life changed to boring rice crackers. Shops are full of packaged gluten-free or wheat-free products, but I mostly don’t like them. They are generally full of additives, emulsifiers and gums and also based on exotic ingredients from unknown corners of Earth. I fully respect the organic quinoa growers of the Andes but I’d rather support local food artisans if I can. In my search for recipes based on naturally gluten or wheat free ingredients, I found an army of the most compelling, engaged and interesting bloggers out there. I like many of them, but my heroes are Shauna of Gluten Free Girl, star of naturally gluten-free cuisine and Felix and Cappera, Italian masters of gluten-free bread making. This cake tastes, looks and feels totally like cake. You don’t really know it’s not made with wheat flour. The method is the result of Shauna’s ideas about the use of ingredients, of a flour mixture by Felix and Cappera and of a recipe of Sandra of Un Tocco di Zenzero. The latter is not a gluten-free blog but fantastic all the same. The original recipe uses tapioca instead of corn, but I can’t buy it in rural Umbria, besides it’s not local. I use whole grain organic rice flour from North Italy. If you are celiac make sure to use certified gluten-free products. To cook gluten-free you need to weight your ingredients, sorry no cups for this recipe except the milk. Pre-heat oven at 180° C (375°F). Butter generously a 25 cm (10 inch) bundt pan Here is my no-fuss, food processor method for fluffy cakes: Add all dry ingredients and the butter, process briefly with the metal blade at high-speed until the butter is cut in minute crumbs. Add eggs and incorporate until the mixture turns golden yellow. Add milk until the mixture is spreadable but firm, you might not need all the milk. Transfer in the buttered pan. 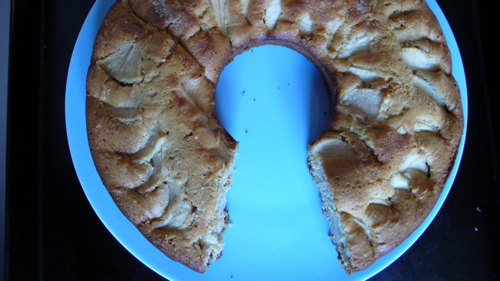 Section the apple in very thin slices and decorate the top of the cake with it. Sprinkle a little brown sugar or confectioner sugar on the apple slices. Bake until set and golden, about 45 minutes. My breakfast is back, thank you ladies. Thanks also to the splendid Gloria At Home in Tuscany, Alexandra from ArtTrav, Rebecca from Brigolante, Melanie from Italofile, and Jessica from Why Go Italy for inviting me to participate with this post to the 1st Italy Blogging Roundtable Anniversary event. Until May 1st, bloggers are invited to expand on their blogs on one of the topics the roundatablers have blogged about in the past year. You still have time to join! Yum!!! Looks great and I’m so glad to hear that you can once again have your favourite breakfast food! Thanks Sandra, it’s been a long wait!